Like anyone who is strapped for time, I’ve also found multi-tasking to be a huge benefit. From putting a wash on as I work out, to starting the pasta and setting a timer as I finish up some work projects, to walking my dog and listening to the latest podcast. I even automate my lunches. I make all of my lunches the Sunday before, and know what I’m going to be eating every single day. And then, with the rise of technology, automating tasks and updates began to take a life of its own. From automating weather updates directly to my phone, to getting flight alerts sent directly to my mail – automating began to take a huge role in my life because it made so much sense to me. Who doesn’t want to save time on repetitive tasks? Who doesn’t want to become more efficient? Who doesn’t want to spend more time doing what they love? It’s a good question, and fortunately, it’s also one I have an answer to. Unlike putting pasta on for a certain amount of time and allowing myself to finish work projects, social media marketing doesn’t work quite the same way. Instead, I find it more helpful to think of it like baking a cake. You’ve to leave it in just long enough that its baking, then test it to make sure it’s done, and then either put it back in the oven or take it out depending on your results! Then you’ve got to make the icing, decorate the cake… make another cake. And maybe another one… a chocolate one maybe? With strawberry filling? Baking is a process where you remain constantly engaged in the process from start to finish. There’s no sitting down and taking a break – or, not for very long. This is the same for your social media automation. It’s about automating what you can, while also staying engaged. Automation can take the culmination of hours of social media work that happens throughout your day, and condense it into just 30 minutes of work. Which then allows you to use your time more wisely (or carelessly… it’s up to you!). I’ll be the first to admit that automation can be a little addicting. Once you become more efficient in one area, it’s easy to get carried away and automate the whole shebang! But with social media, it’s important to remember that it’s a human experience. Not everything that can be automated, should be automated. 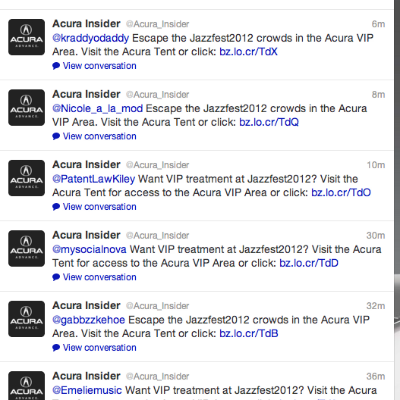 Here we see Acura tweeting out an invite to anyone who used a specific hashtag. The problem with this is that it’s an event with a physical location, and the targeting is ineffective. But it’s not always so neat. 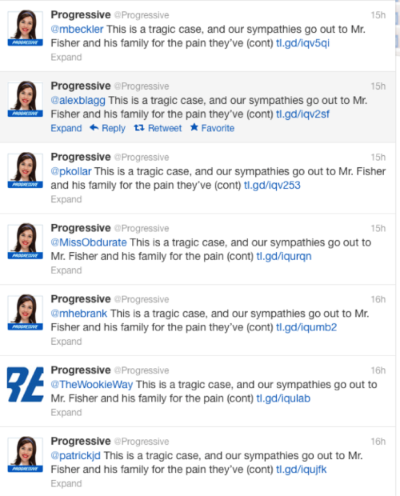 Progressive have almost become famous for their Twitter fail. 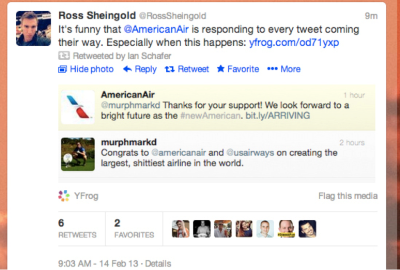 And American Air similarly came under fire for automating inappropriate and unsympathetic responses. The lesson here is obvious: not everything should be automated. A lot of your social media marketing requires a human presence to consider target audience, or to assess the situation. People appreciate unique and individual responses on social media, so it’s advisable not to utilize automation in this way. I like to curate and distribute our social media sharing every morning in batches. It usually takes me about 30 minutes, and it means that I’m providing consistent content to our readers all day long. It also allows me to send content to our readers at an optimal time that suits them. I’m frequently asked what’s a good rule for content sharing – and, as much as I’m asked this question, I’m also always just as hesitant to answer it. The idea is that your social media platforms should be about your audience, and what content is of value to them – regardless of its source. People hate to follow brands that just talk about themselves. Curating content also has the additional positive factor of building relationships with the other business whose content you’re sharing. Another rule I’ve seen followed is Tipping Point Labs’ 4-1-1 rule. This takes curating other’s content to another level, with most of the focus being on others. For us, we’ve changed it up quite a bit and we constantly change it depending on our engagement. Right now we’re keeping with the 4 – 4 – 2 ratio as a guide. Your personal tweets are a bit of fun, and they’re not usually time sensitive, making them the perfect tweets to automate. #QuoteOfTheDay is a popular hashtag that’s used on Twitter to humanize a brand, as well as inspiring customers and readers. Or, what we like to do, is have a little pun fun with it! Got a new blog post? Then you’ll definitely be interested in sharing it on your social media platforms. Automation can be used so that new posts get sent directly to your social media platforms. 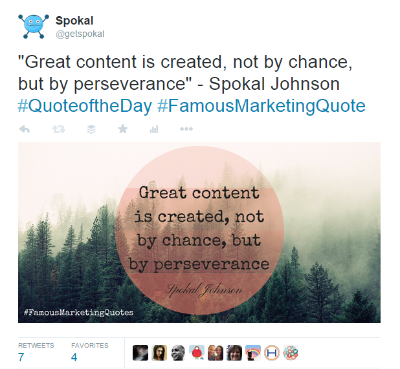 At Spokal, we like to automate our newly published posts so that they always publish at the same time – which is the optimal time for our readers – on to all of your connected social media accounts. What’s even better is that we can actually edit our social media sharing before we even publish it, so we have full control over how we’re going to be presenting our content, before we even publish it. Using social media marketing automation is a fantastic way to streamline the social media process, but the biggest takeaway I’d like you to leave this step with is that you should NEVER automate customer interactions. Of course, I’m not saying you’ll experience anything like the crisis that Progressive did, but automating customer interactions can damage your reputation and engagement. Sure, many companies like to automate a “thanks for the follow” type comment, and this rarely does much harm (or much good) but beyond that should be left to the humans. Spokal lets you connect your Twitter, Facebook, and LinkedIn accounts so that you can schedule your content to be shared throughout the day. 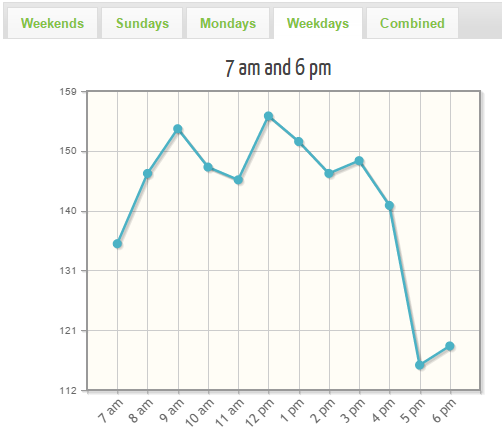 You set the schedule based off of you social analytics. Spokal also integrates with Feedly, so you can easily tag any content that you find online that you’d like to curate with a “Spokal” tag and share it with your audience by simply dragging and dropping the content into the calendar. This is made even more convienient if you download the Feedly extension so there’s no hopping from window to window! Buffer and Hootsuite are other tools that also manages your social sharing without any of the other inbound marketing features that Spokal has. There are also social media platform-specific solutions, such as Post Planner for Facebook and BundlePost for Twitter. Tools like IFTTT and Zapier are amazing for the automation obsessed! These services connect one service or app, with another service or app that will be triggered under certain circumstances. For example, when the weather channel predicts rain, I’ve set up a trigger so that I’ll get an alert to my iOS device! The only downfall of this is that I live in Vancouver and it’s spring right now – which means I kind of get alerts most days which doesn’t do much for my mood. “Oh rain again? Yeah. Thanks”. Still. I remain optimistic. Only 3 more months until summer. Obviously, a well-spaced schedule hits your audience at times that makes sense. But it’s best to get more specific. To do this, you can look at your social analytics to see when your audience is more engaged. But statistics are often only effective within the context of a specific business. If you want to know about your specific business, there are also tools such as SocialBro, Followerwonk and Tweriod that can analyze your followers and tell you when they’re around and engaged. Here’s an example of Spokal’s graph for our engagement. But obviously this all means that you’re still out of the conversation, even with all of these intelligently utilized automated. 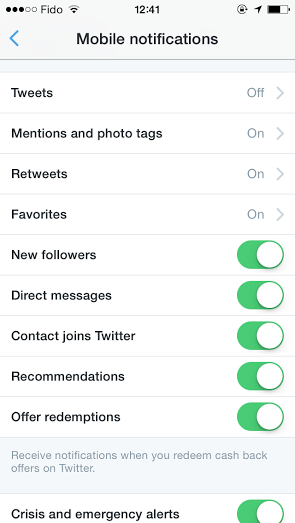 Personally, I use my phone’s notifications to alert me to anything on Twitter and Facebook. I’ve basically every notification turned on, so I don’t miss a beat. A lot of its followings, favorites etc. but I look over every so often to ensure I’m not missing something really important. But if you want to be more thorough, Mention is a powerful tool that works similar to Google Alerts so you can track your name across websites, blog and social media channels. Just like Google Alerts, you can be updated via email when you receive a mention so you don’t have to be in the platform all the time either. And, of course, always set time aside to actually be engaged on social media. I like to make sure I spend some time in the mornings, then I quickly check in in the afternoons (just to double check I haven’t missed anything), and again in the evenings before I sign off for the day. I also like to schedule time for Twitter chats. Twitter chats are a great way to learn about your industry, get some amazing insights into a topic, and engage in a community that you’re interested in. Check out the Twitter Chat Schedule for more information on what ones are coming up pretty soon! Marketing automation and social media are far from being at odds with one another. Conversations, engagement and human interaction are always going to be an important aspect to your social media marketing strategies. In fact, because you’re now free of the tedious sharing/posting throughout the day, you can focus even more on engagement and starting really great conversations. With marketing automation you don’t have to be constantly present and staring at a blank screen waiting for the next big comment/like/share to hit. Instead, you can go and work on your other – possibly more productive – tasks, and simply check in on your social media platforms occasionally, or, have them check in on you! Once you’ve gotten into a good automation routine, it’s also important to remember to test, test and more test. As Unbounce says #alwaysbetesting. Do you’ve any tips and tricks for social media marketing automation and engagement? What’s your system? What problems have you encountered? I’d love to hear from you. It’s such diverse world, and I’m always curious to hear about what works for different people, so leave me a message in the comment below! Or, you know… you can just say hi! Who doesn’t like that!? Awesome! Thank you! If you want to read more, and get regular updates on what we've been yammering on about, then feel free to leave us an email. We'll also send you a few bits and bobs that we think you'll find useful for your inbound marketing! 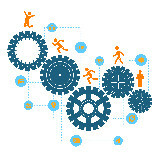 Interesting and useful article on marketing automation. I used to use some pretty nifty ifttt recipes to automate some of my social posting updates. I had to replace ifttt to avoid having 4-5 posts show up at the same time and look overly spammy on LinkedIn and Twitter streams. I refined this method, albeit its more manual now than before. I had the exact same issue with IFTTT Neil, but once I smoothed out some of the glitches it’s been amazing! It sounds like you’re using marketing automation how it’s supposed to be used – with lots of testing and updating! WOW! Awesome guide put together with lot of meaningful strategy and tools that makes it work. Mention is awesome for social media monitoring, especially their Email-style layout & responding to the mention on the fly. I always have mix of 60% automation & 40% personalized in my social media automation strategy. Loved the article! I am trying to make sure I don’t piss people once I launch my business. Thanks! This was very informative and insightful. However I have one question was your article meant to cut off like this? It’s all about looking at the, what?… Do to the in-depth nature of your work I thought it was probably a swipe of the hand the mistakenly removed this part. What am I missing? You can use Blog2Social social media cross-posting plugin. 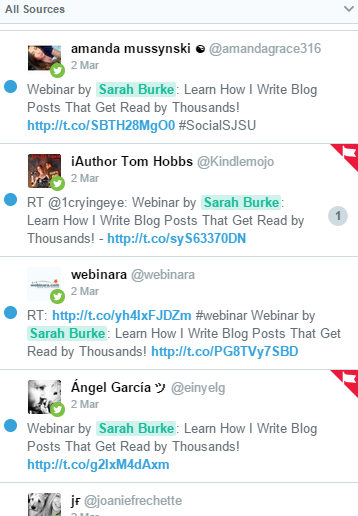 A user can cross-post blog posts on social media automatically, customized and scheduled. I’m now trying a tool called eClincher… have you heard of it? I would like to hear some thoughts before deciding to subscribe or not. Thank you!! thank you very much for your article! 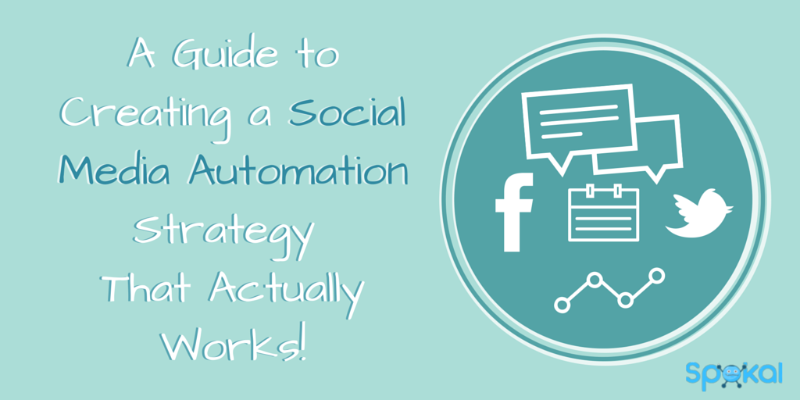 Great reading and a great guideline for everyone who wants to start with social media automation! 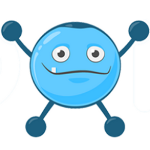 As another tool for automating social media I want to recommend you Blog2Social. This tool can be used as plugin for your WordPress blog to share, reshare and schedule your blog posts to 14 different social networks (Twitter, FB, Pinterest, Instagram to name a few ). One can test Blog2Social as a free version with already a bunch of nice features like the schedule calender and best time planner.